Benjamin Franklin . . . James P. Espy . . . Cleveland Abbe . . .Carl-Gustaf Rossby . . . Jule G. Charney . . . just a few of theremarkable individuals who struggled against formidable odds tounderstand the atmosphere and predict the weather. Where they sawpatterns and processes, others saw randomness and tumult-and yetthey strove to make their voices heard, often saving lives in theprocess. Storm Watchers takes you on a fascinating journey through time thatcaptures the evolution of weather forecasting. From the age whenmeteorology was considered one step removed from sorcery to themodern-day wizardry of supercomputers, John Cox introduces you tothe pioneering scientists whose work fulfilled an ancient dream andmade it possible to foretell the future. He tells the little-knownstories of these weathermen, such as Ptolemy's weather predictionsbased on astrology, John Finley's breakthrough research inidentifying tornadoes, and Tor Bergeron's new techniques of weatherforecasting, which contributed to its final worldwideacceptance. Filled with extraordinary tales of bravery and sacrifice, StormWatchers will make you think twice the next time you turn on thelocal news to catch the weather report. Today’s weather forecasting is a marvel of digital electronics; it is more accurate, more objective, and more useful than ever. It is the product of advanced meteorological science, employing some of the most powerful and sophisticated computers on the planet. But before all this modern technology was the work of a few determined, brilliant individuals. These men persevered without the benefit of such devices as satellites and automated weather stations to discover how the atmosphere works and how to foretell its future. Storm Watchers tells the remarkable, little-known stories of these pioneering scientists. John Cox presents their epic quest to determine how to predict the weather accurately, tracing the development of meteorology from the time of Aristotle up to the recent breakthroughs in weather prediction. Before science explained the ways of the winds and the causes of storms, the study of weather was an act of courage. Cox reveals how the early weathermen struggled to have their voices heard even as naysayers outnumbered them. He also explains how, in later years, conflicts raged on both sides of the Atlantic, with "practical" weather forecasters on one end of the debate and "pure" scientific researchers on the other–each suppressing promising developments. This lively narrative account also includes fascinating stories of many devastating storms, floods, shipwrecks, climate changes, and weather controversies in history. It takes a fresh, behind-the-scenes look at the "American Storm Controversy" and the conflicting forecasts that delayed D-Day. It also tells how early meteorology was considered one step removed from sorcery and about the "discovery" of El Niño. The efforts of the weathermen profiled in this book have saved and continue to save many lives. Storm Watchers is as much a tribute to their persistence and genius as it is a testament to the remarkable achievement of weather prediction–powerful, everyday science that is too often taken for granted today. JOHN D. COX, a veteran science writer, is also the author of Weather for Dummies, which the Bulletin of the American Meteorological Society called "extraordinary." His journalism experience includes work at the Sacramento Bee, Reuter Ltd., and United Press International. In 1995, Cox was awarded a Knight Science Journalism Fellowship at the Massachusetts Institute of Technology, where he studied oceanography and atmospheric science. 4. 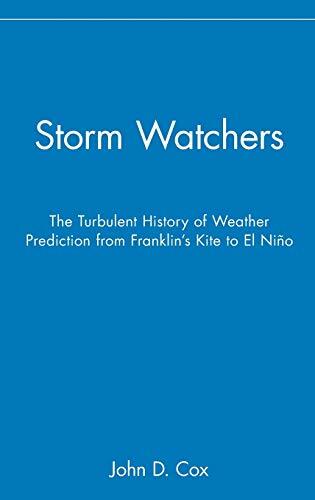 Storm Watchers: The Turbulent History of Weather Prediction from Franklin's Kite to El Nino.